This was my first ever stencil project, but it worked out beautifully. It sort of looks like wallpaper... but I can't afford the wallpapers I love, and I cringe a little at the thought of taking it down again when I get tired of it. It just seemed a lot simpler to paint what I wanted. 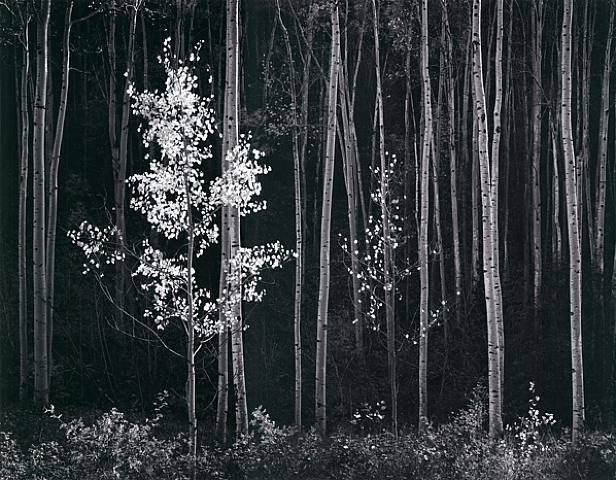 This Ansel Adams print of aspens has stuck in my mind since the first time I saw it. I think it would be incredibly calming to wake up to a forest every morning. 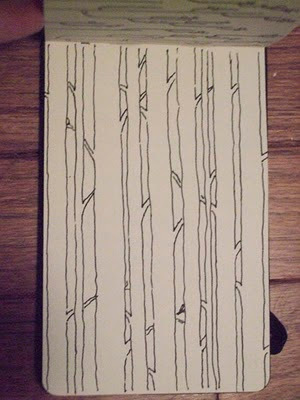 This is a doodle I did in my sketchpad during a long, drawn-out faculty meeting. There are a couple readymade stencils out there. This is one by Cutting Edge Stencils has a bit too much detail for my taste... and it is only 48 inches high, so I was afraid there would be an obvious line in the middle of my wall. 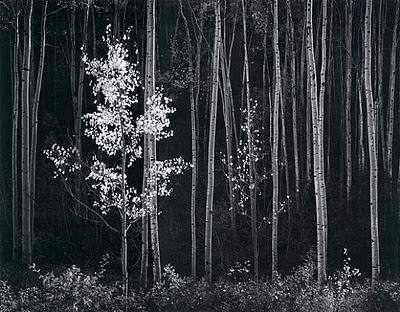 And, I wanted to paint the negative spaces between the trees, not the trees themselves. The Stencil Library has one that is larger and paints the negative spaces, but once again, it is too busy, I wanted a simpler design. And, the wall size size stencil... which is enormous... is 140 euros. I decided to make my own. I found this plastic posterboard at the local craft store, and it is just the perfect material for making a stencil. Blank stencils only came in a tiny 10x10 sheet, but the plastic posterboard is 22x28 inches. I taped a couple sheets together with packing tape to make a 44x28 inch sheet. I drew with a dry erase marker, so that I could just rub away a line and redraw it. 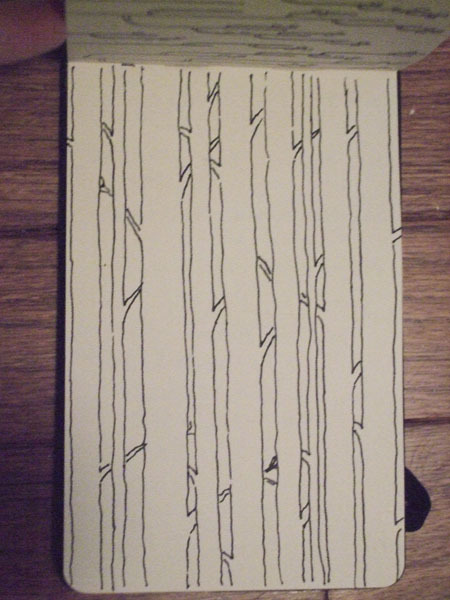 I drew the lines freehand, without a ruler, so that they would have an organic character. I cut out the space between the trees with a small boxcutter knife. 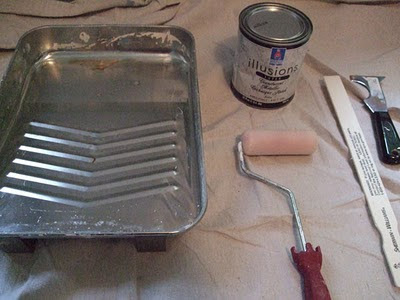 So there are my supplies... a 4 inch foam roller, a regular paint tray, paint stirrer and an opener for the paint can. I decided to use Sherwin Williams Translucent Metallic Technique Finish. They're actually discontinuing this paint, so I got it on clearance for $5!! But they say they have a replacement metallic paint, so if they are out of this one they can probably still help you out. 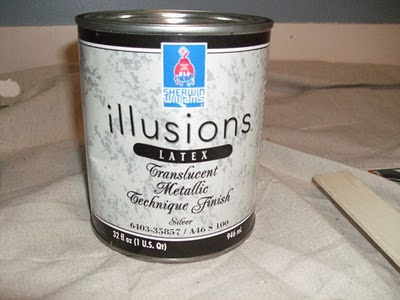 Lowes also carries a metallic paint, but they wouldn't give me a sample, and there is all this oddness about the fact that their metallics need to be paired with other colors... so I decided to pass on $20 for a little can that I wasn't sure would work. Since this is the first time I've ever stenciled, I decided to try it out on a piece of brown craft paper. 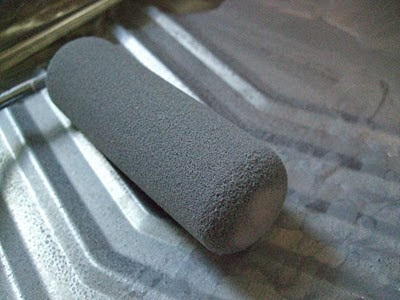 When you're stenciling with a foam roller, you want to load it up so that the entire roller gets an even coating, then squeeze most of the paint out of the roller by rolling it back and forth along the ridges of the paint tray. 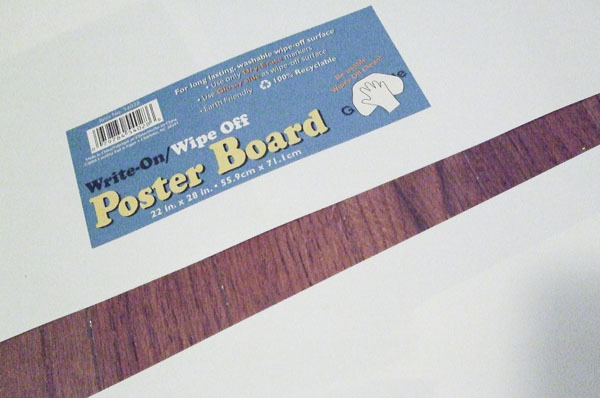 You roller should be almost dry. Peel the stencil away, and there it is! Perfect! I'm glad I did a test, because I ended up changing a few things. My initial idea was to stencil the bottom of the wall, then the top. 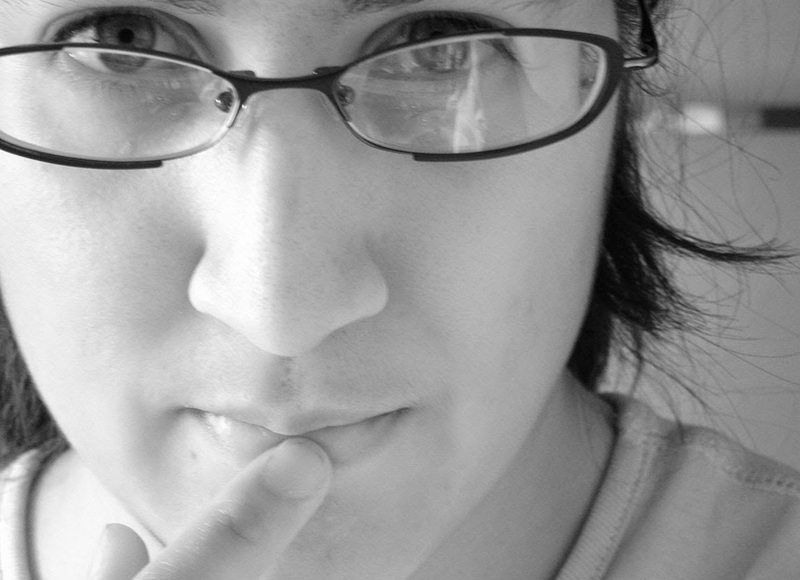 But I decided there was no way that was going to look seamless. So I made my stencil twice as large. I used 4 sheets of plastic posterboard, and my finished stencil was 88 inches tall and 28 inches wide. The wall is actually about 102 inches high. But it actually worked out that the stencil was smaller than the wall for two reasons. First, there was a radiator in the way along part of the wall. And more importantly, the extra room at the top of the wall gave me space to use lots of painters tape to hold the stencil in place. 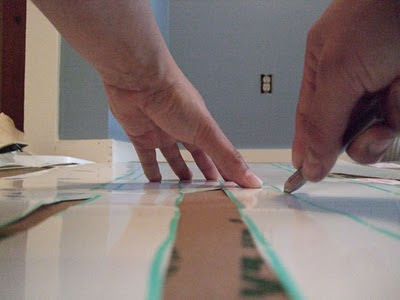 I had planned to use Scotch Repositionable Adhesive, but my stencil was just to large and heavy for that to work. 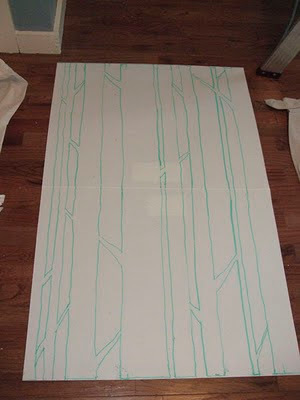 Instead, I used lots of painter's tape, and the tape actually became extensions of the trees at the top and bottom of the stencil. Sometimes I even made an extra branch with tape. BTW, I painted the wall a few days ago with two coats of Behr Premium Plus Ultra, in a gray-blue color ("Windsurf"), in Eggshell finish. Here is the finished wall. I even went over the doorframe. 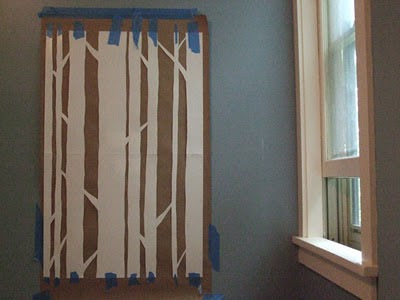 Okay, so it is a little frivolous to stencil a closet... but isn't it romantic to have a forest behind your clothes? It reminds me of the C.S. Lewis's wardobe that lead to Narnia. And I was on a roll, it only took another 45 minutes to complete. This is beautiful - what a wonderful job! totally amazing! great song pick for the video too. & I love the color combo. This is so beautiful. I also have a thing for trees in my bedroom. I built one out of string. I love that you decided to do the closet as well. I think it is always great to have a bit of unexpected in the everday. ABSOLUTELY LOVE IT!! The room looks really great. You did an amazing job and you made it look quite easy actually. Thanks for sharing the process. 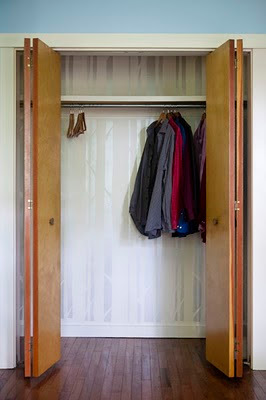 This has really inspired me to do something like this to one of our rooms. Absolutely lovely. Thanks so much for showing. How many cans of paint did you end up needing for the project? Thanks for all of your lovely comments! 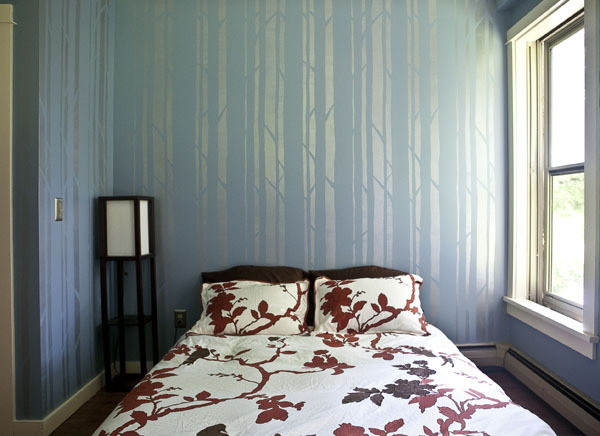 The bed is decorated with a duvet cover from target, a Dwell Studio for Target design. I love that Target has made one of my favorite home design shops more financially accessible! I only needed one small can (quart?) of silver paint to finish the project. The silver paint is from Sherwin Williams... I bought a couple cans in silver and pearl from a discontinued line for a great price. I just run into it and I'm so glad I did it! it looks so beatiful!! This is amazing! 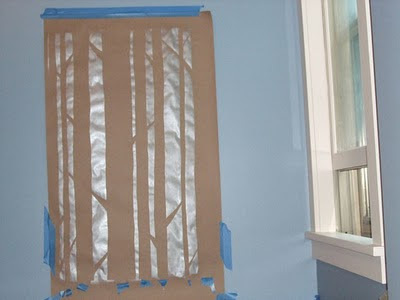 Did you paint right over your stencilling with the blue-gray colour? 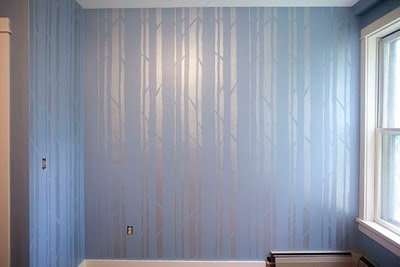 I painted the wall blue first, then I stenciled the silver over the blue. Is that what you meant?